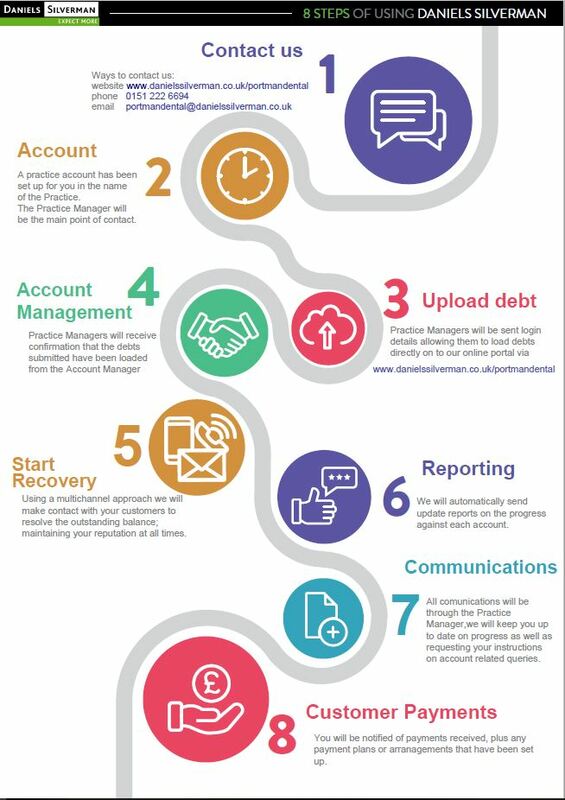 The new debt recovery account for your practice has now been set up. We are ready to begin the debt recovery process and you will have received your welcome email. Using the login details provided in the welcome email, you can login to the online portal and fill in the debt referral form with the details for your customer. Once a debt has been uploaded to your account, we will begin work on it straight away. You can also login to the online portal and request a status report at any time. An up to date report will then be emailed to you providing the current status of each account we are currently chasing. Q: What if I refer a debt and I need to amend the details? Q: What if a customer comes into the practice to discuss their debt after it has been referred for debt recovery? A: Ask the customer to contact us on 0151 707 6061 and they will be directed to the appropriate team to deal with their query. Q: What if a customer comes into the practice to pay their debt? A: Accept the payment, and send an email to portmandental@danielssilverman.co.uk providing the details for the customer and the amount they have paid. Q: What if I wish to close an account after it has been referred for debt recovery? A: Send an email to portmandental@danielssilverman.co.uk providing the details for the customer and the reason for the closure of the account. Q: I have received an email asking to provide a response to a dispute, what does this mean? A: The customer is disputing that the balance is owed, and we require further information or documentation in order to respond to this dispute. You will be provided the details of the dispute, simply respond to the email received and your account manager will respond to the customer accordingly. Q: I have received an email asking to provide proof of debt, what does this mean? A: Most likely we have been in contact with the customer, and they have asked for proof the debt is owed. This could be a signed consent form, treatment plan or any other documentation the customer has previously been provided in regards to the debt owed. Simply respond to the email received and your account manager will respond to the customer accordingly. Q: I have received an email asking if we would like to put forward a reduced sum in full & final settlement, what does this mean? A: When we have exhausted our pre-legal recovery efforts, and this has not resulted in payment, we can contact the customer offering a reduced amount to clear the debt. Simply respond to the email you have received with the figure you would be happy to accept, and your account manager will send this offer to the customer. Q: I have had an update advising ‘Customer has been sent a Standard Financial Statement (SFS)’, what does this mean. A: The customer has been identified as being in Financial Hardship. A Standard Financial Statement is sent to assess the customer’s financial situation, with a view to setting up an affordable payment arrangement to clear the debt. Q: I have received an update advising ‘Customer classed as vulnerable – currently placed on 30 day hold awaiting further info/documents’, what does this mean? A: The customer has been identified as being vulnerable, meaning their personal circumstances makes them especially susceptible to detriment and we must act with an appropriate level of care. This could be due to physical or mental health issues, caring responsibilities or a bereavement. Your account manager will advise you, and keep you updated, on the situation and how we intend to move forward. Q: I have had an update advising ‘PTP Sent’, what does this mean? A: PTP means Promise to Pay – the customer has agreed a payment plan to clear their debt, we have sent confirmation to them of the agreement terms. At Daniels Silverman debt collection agency, we’ll give you an honest view of your case. We always consider every option available and explain exactly what we can do – if we cannot collect the debt we will tell you why. Our job is to debt collect what is owed to you, and we do so determinedly, but conscientiously. Our debt recovery specialists are trained to negotiate and mediate to a high level, in order to collect your debt before any need for potentially costly legal battles.